This page last modified 2010-04-20 20:18:01. I love these on my War, but they do look funky as hell with all Iron Musketeer gear on. these boots are the sh*t, @ 52 im pulling DA off like 4-6times a fight! The boot procs about 1-2% which is 1-2 extra swings EVERY 100 swings. Its like the only equip that's barely worth putting on your feet which can be rivaled by thick sollerets, and really not a footwear to be wearing during WS because it won't fire off DA in most of your WS. Rutter Sabatons would be a lot better for WS and Dusk Ledelsen (+1 would be a lot better) for +2% haste and +4 attack during TPing as the haste also affects shadow casting. hahaha, i accidentally tossed these today, gotta finish the rest of the Artifact than drop it all, than start all over again...? can anyone tell me what the % on the Double Attact effect is? 5% or 10%? isn't it activated in Yellow HP ? I keep my Hp on yellow any way . and i sold the ring now ... ! The original speculation was about a 5% increase in Double Attack (which has been parsed at around a 10% rate). People have recently begun taking a closer look, and it seems as though the Fighter's Calligae only give about a +1.5% increase to Double Attack. Still, even a small increase to double attack is priceless, but a lot of Warriors no longer see it as a sin to take off their red boots. The reason is that double attack can fire off on your weaponskills, too. So while your additional strength from the creek boots is guaranteed to boost your damage a bit, the double attack enhancement on the AF boots gives you a slightly higher chance of dramatically increasing your WS damage. And for skills like Rampage, which is a five hit skill... that's five chances for double-attack to fire off (six if you believe that dual-wielding adds an additional attack to multi-hit weapon skills). Yeah kind of hard and I like to thank everyone that helped me with AF2(and AF1). I deuo'ed this with one of my best friends in real life. He is a 63 whm and I went as a 65 ninja. Let's just say after 15 mins ^^ this fool dropped and I got me my boots. Seeing these boots match so well with my Iron Musketeer gear I feel there should be an added effect on these boots. I wanna say thanks To Phasen and Dalenn too. Whoa! Yuor accually reading my sig O_O? ....>_>...Stop...Your making me paranoid! It means Double Attack will happen more often. what does this mean? does it increase the rate? Does it get tastier than this? I've seen level 75 WAR's that still use these and I can't wait to get my paws on them. wow these things are amazing I really like everything about the War's AF feet legs and boots i really like the body armor because It will make a war sort of like a pld but more hate which is awsome. BTW how long did it take to get these. I got these today. With a full party of all lvl 60+ It took around an hour/hour and a half. The hardest part was going into Castle Oztroja, which wasn't actually too bad. We had one part in which i took some aggro from a Yagudo interregator causing a huge link train, but the BLM who was with us used Blizzaga 3 and took most of their HP down quite a bit. The Leeches themselves were pie since they conned as EP-DC to me and they only hit me for 49-55 dmg a hit. We got the Skin on the first drop and then headed back to Bastok. I'm now the proud owner of my Fighter's Calligae! ^^ Just two more lvls til i can wear them though ; ;. Cause Of the AGi+3 Doi! lol.. doi :P i like agility, looks good. 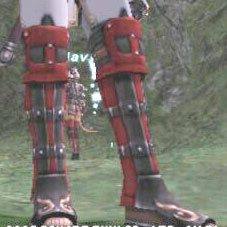 It has more defense than most "feet slot" armor of that level.